In this enchanting adaptation of the cherished Roald Dahl tale, five children and their families walk through the doors of Willy Wonka’s fantastic chocolate factory and enter into a world of pure imagination. The enigmatic Wonka is on a secret mission to find an heir among four impudent kids and the lovable Charlie Bucket. 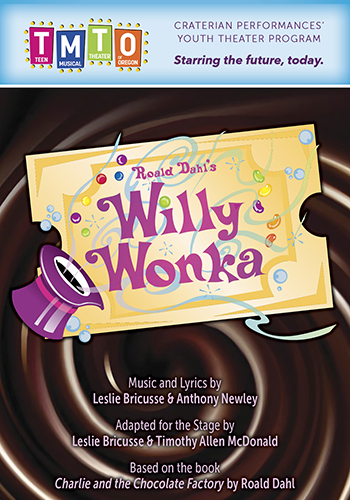 With songs from the classic 1971 film starring Gene Wilder, as well as new music by Leslie Bricusse and Anthony Newley, this magnificent musical concoction is sure to satisfy adults and children alike. You’ll feel like you won the golden ticket as you enjoy this timeless story told by the always satisfying Teen Musical Theater of Oregon!